Digital gauge sole separately, HERE. The Minneapolis Blower Door has long been recognized as one of the best designed and supported building airtightness testing system in the world. 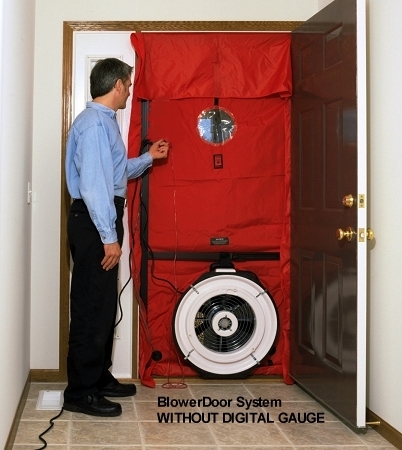 Combined with specialized accessories and testing procedures developed by The Energy Conservatory, the Minneapolis Blower Door is widely used by utility DSM programs, energy raters, HVAC contractors and weatherization professionals. Lightweight, rugged, injection molded fan housing. Precise, stable flow measurements without the need for gauge dampening. The Model 3 Fan provides quick and accurate flow measurements from 300 to 6,300 CFM (includes Flow Rings A and B). Optional Flow Rings C, D and E will measure down to 11 CFM. Variable fan speed control (solid state - cruise control compatible). Maximum Flow: 6,100 CFM (free air), 5,250 CFM (at 50 Pa),4900 CFM (at 75 Pa). Minimum Flow: 300 CFM (Ring B), 85 CFM (Ring C), 30 CFM (Ring D), 11 CFM (Ring E). Dimensions: 20" inlet diameter, 10.25" length. Flow Accuracy: +/- 3% (using DG-700 or APT system). Rings D and E +/- 4% or 1 CFM, whichever is greater. Calibration: Meets ASTM Standard E779-10, CGSB-149.10-M86, RESNET 2012, EN 13829, CIBSE TM 23, NFPA 2001, and ATTMA TS-1. Adjustable Frame Material: Extruded Aluminum. Panel Material: Nylon w/ built-in vinyl window. DG-700, APT System: See Specifications on Digital Pressure Gauges and Automated Performance Testing System pages. The padded accessory case comes with every Blower Door system and has loads of room for your gauges, manuals, tubing, speed controller and nylon panel. It even has a padded laptop computer pocket and file compartments for organizing literature, forms and other documents. 2300 TruReward$ points will be placed in your account when you buy this item.